Leonardo Martelli - Menti Singole Vol. 2. Vinyl EP. Bleep. Antinote youngster drops volume 2 in his Menti Singole series! Four deceptively simple electro leaning tracks that recall the atmospheres on volume 1 yet also show a slightly more sophisticated take on the sound. EP closer ‘Sofia’ sounds like an old grime instrumental, stark and foreboding metronome percussion with a chopped up Biggie Smalls acapella. Each track is soaked in the kind of melancholy that old Stasis or Likemind records manage to evoke but Martelli clearly has other external influences at play here too. 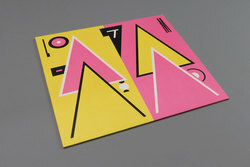 ‘Micaela’ is perhaps the most immediate club cut here – playful acid!